alanmichael 1, please see Franco Corelli thread for my opinion on the Vienna 1970 Don Carlo. (Curtis-Verna) I think I was at the Met on the Saturday afternoon when she made her unscheduled debut as Aida. I was a little pipsqueak back then, and my aunt had promised me a Met matinee (which in those days meant Saturdays). I do recall both the female leads were "new", one scheduled (which would be Irene Dalis as Amneris) and one unexpected (which would have to have been Curtis-Verna as Aida - she stepped into the role when Tebaldi was forced out due to family tragedy). The date was 11/30/1957, which was earlier than I used to think, but it's the only matinee of Aida at the old Met that matched what I remembered. What did I think? Hey, I was just a kid, and was very impressed by the whole grand spectacle even though we were way up in the upper balconies with awful sight lines (something the old Met was notorious for). Inspired by your post I listened to the Cetra Aida with Curtis Verna and Corelli and it was better than I had remembered. Her dark timbre is pleasant and the high C okay. It is just such a pity that as Donna Anna she and the other women spoil the Cetra Don Giovanni which has the best male trio ever recorded (Taddei, Tajo, Valletti). How do people feel about the new Aida conducted by Pappano with Kaufmann? Kaufmann is a wonderful Radames, the rest of the cast is ok but nothing special. Not a recording I've felt like returning to very often since it's come out. My impression as well. Kauffmann and a bunch of technically proficient but nondescript singers in a rather bland rendition. The recording is stunning, job well done, I still have some trouble with Harteros, that's my problem however. One oroblem apoears to have been that she has ne er sung the role on stage. This is curios in the modern day when recordings are infrequent and when she has to compete with the likes of Callas, Proce and Tebaldi. I noticed from the last year that I haven’t done a proper listening challenge of one of my favourite operas: Aida by Giuseppe Verdi. I had even purchased the first Karajan Aida by Decca, and I was very happy with it. I had already listened to others but not the ones by Jonel Perlea, Antonio Pappano, Riccardo Muti in Munich or Claudio Abbado at La Scala. This challenge didn’t change much of my previous opinions, but shed some light in recordings like the second Karajan and the Solti in Rome. In the end, I realized that every recording was lacking in something the others had and they complemented each other. No recording was perfect, and that’s why I decided to tie the challenge in 4 winning recordings and a 5th place. I should use a pro&con style for reviewing the four best. The last place was taken by the Scala Abbado recording for DG, almost the only try by the Yellow brand but with the major sin in the female cast and the utterly cold sound and acoustics of La Scala. Ghiaurov and Domingo (Amonasro/Radamès) do a decent job. Ricciarelli (Aida) screams at times and is the least competitive of Aidas in Stereo. 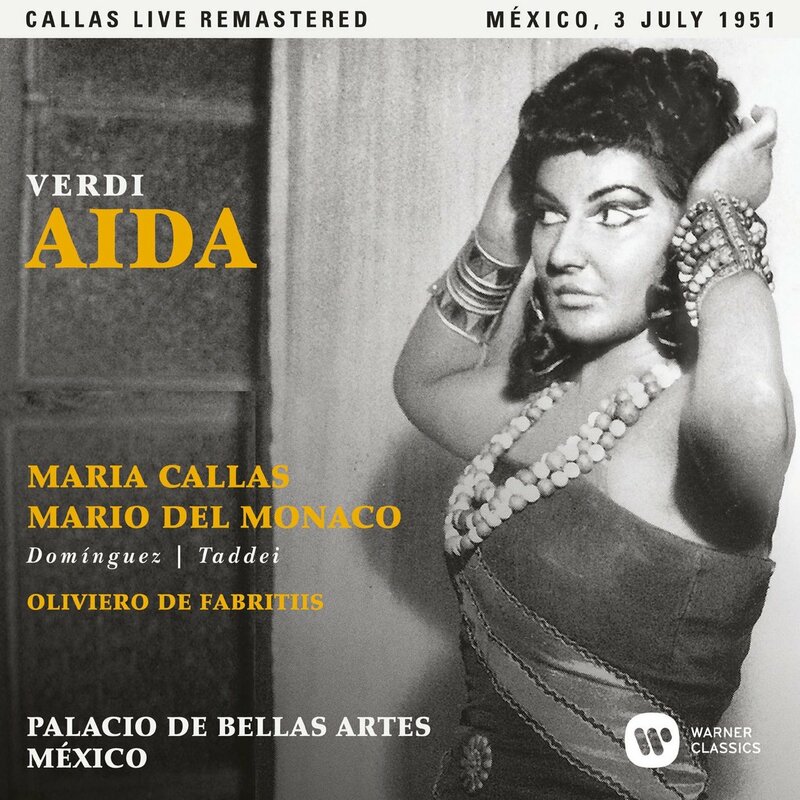 Other Aidas in mono that I didn’t like were Milanov in the Perlea studio recording and Stella in the Metropolitan conducted by Fausto Cleva in 1957. The Cleva was the first to be reviewed and could stand in the bottom for an ok recording. The Perlea RCA recording was not bad, with a fantastic Björling in Radamès… and nothing else in the cast. In a better position, the Scala performance of Aida in 1960 (Myto Sanzogno) features a younger Birgit Nilsson that is believable in the title character and can please in the arias, complemented by the fine Ferraro’s Radamès. Two strong yet little competitive Aidas in stereo were the “ugly-duck” Leinsdorf London Symphony recording (late L. Price and early P. Domingo) and the “pleasing” Antonio Pappano recording for Warner Classics with Anja Harteros and Jonas Kaufmann. I need to call the Leinsdorf recording as an “ugly-duck” although being significantly better than the Abbado recording. The cast is underwhelming. Two singers off their prime like Leontyne Price and Grace Bumbry, and singers without the necessary weight at that time like Plácido Domingo, Sherrill Milnes Hans Sotin. Not to mention the lack of personality of the acoustics and the playing of the LSO and the distorted bits that the latest remaster couldn’t fix. The cast is star-studded but what promised to be the stereo RCA Aida has quickly been forgotten in the internet and forums. Good thing their lovers saw a remastered reissue last year. The Pappano recording for Warner –yet one more for the catalogue- is like made for showing off the singing qualities of Harteros and Kaufmann, with the latter achieving a result decent of the legends of the past. Kaufmann in Radamès doesn't have the projection but he does have enough depth to become credible in his own way, almost singing like a baritone. The rest of the singers are quite good, and the main ones can convince me. I praise more the job of the MMF, Warner and Antonio Pappano for the ethereal orchestral playing, the HD sound of the Temple scene, the cleanness of the brass and the chorus. This is one of the best casts that could be assembled in the 21st century. Good Job. Thumbs up. Now comes the time to address two good recordings that were close to the top five: the Serafin studio recording (Callas/Tucker/Barbieri) and the live Muti recording in the Bavarian Opera in 1979 (Orfeo). They are quite flawed: Serafin for the cast and Muti, for… Muti. Serafin conducting La Scala in 1955 has the best cast Columbia could gather… but I hope it wasn’t. Barbieri, Tucker and even Gobbi are the great let-downs of the recording. Radamès and Amneris could seem competent at first, but they never moved forward and shone in their roles. Gobbi could have been perfect for the Amonasro role but for the most part he sounds tame. Tucker cannot show more in Acts III and IV. They became too impersonal, and this marked the whole recording. I can only save the majestic Maria Callas, in the peak of her powers though not as powerful as her live performance in Mexico. It's not a cookie-cut perfect Verdi opera like Rigoletto where everything has to work. The greatest advantage of the live Munich performance in 1979 conducted by Riccardo Muti is the cast assembled, especially the secondary cast, Plácido Domingo, Siegmund Nimsgern and Brigitte Fassbaender (Radamès/Amonasro/Amneris). Anna Tomowa-Sintow in Aida is the loser with a dark diction that blurs her character. Fassbaender in contrast has a triumphal night with her commanding Act IV, considering her already excellent Act II. But what drives me off this performance is the stormy, rushing pace by Riccardo Muti that ruins the experience. It’s not swift. It’s fast and I cannot bear it. Although out of the four winners, I found this to be a very competitive recording, and in fact it was in my top 3 in the past. But this comparative review has shed some issues. The famous Solti Aida in Rome with the main RCA line-up (Price/Vickers/Merrill) has excellent sound and playing, but it gives me a general Decca feeling. To sum-up, it has a very fine packaging, but it doesn't tell me a lot. Very bold and probably spectacular orchestral sound. This is the main issue for me, but the singers are also to “blame” for it. Vickers and Gorr are spectacular and imposing. 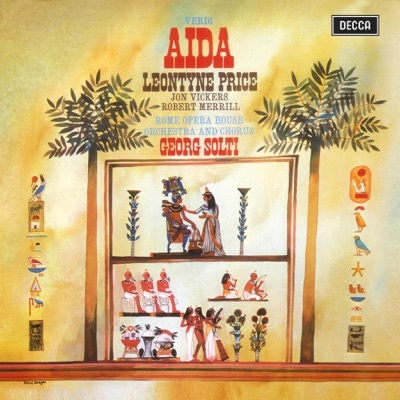 Merrill is effective in the highlights, Leontyne Price is not one I really like for Aida, a tough spot, despite her dramatic interpretations of the main arias, actually because of her timbre. While this is very good, I don’t see myself buying a copy of this recording when I take others in consideration. Ds: Fireworks style, and Aida…? Orquesta y Coro del Palacio de Bellas Artes, México D.F. The new WC remaster in 2017 offers a bumpy and metallic sound from the orchestra, but it's a bit annoying that the applauses and commentaries are cut. I also have complaints for the prompter being audible, and Fabritis in the pit is sometimes too fast and switches pace quite often. Alright. This is what can be called a first-class performance by all the singers, especially Callas and Del Monaco. Domínguez’s Amneris is commanding and never loses intensity, not even in the trial in Act IV. It has the E flat at the end of Act II. Ds: unpleasant sound quality and cuts at the end of the acts (Warner). After trying almost all the Aidas, the recording I own felt top-quality and too safe at the same time, but I wouldn’t change my mark. It’s not the first time I think that, but a month ago I gave a listen to the CDs and I was really pleased with Carlo Bergonzi. In sound, I'm feeling that both the Muti and this recording went for the same goal and Muti achieves more obvious results. This sound is mellowed and the acoustics are quite good. MacNeil is a nice Amonasro. In the end, he nails the role in the Nile scene. He is swift, quite soft and not spitting. Tebaldi also grows and she is in her prime, with a light voice that suits the title character. Bergonzi's sweet voice squashes Domingo and Carreras at the same time. Only Del Monaco can challenge him. Giulietta Simionato is a nice Amneris. She does pretty well. 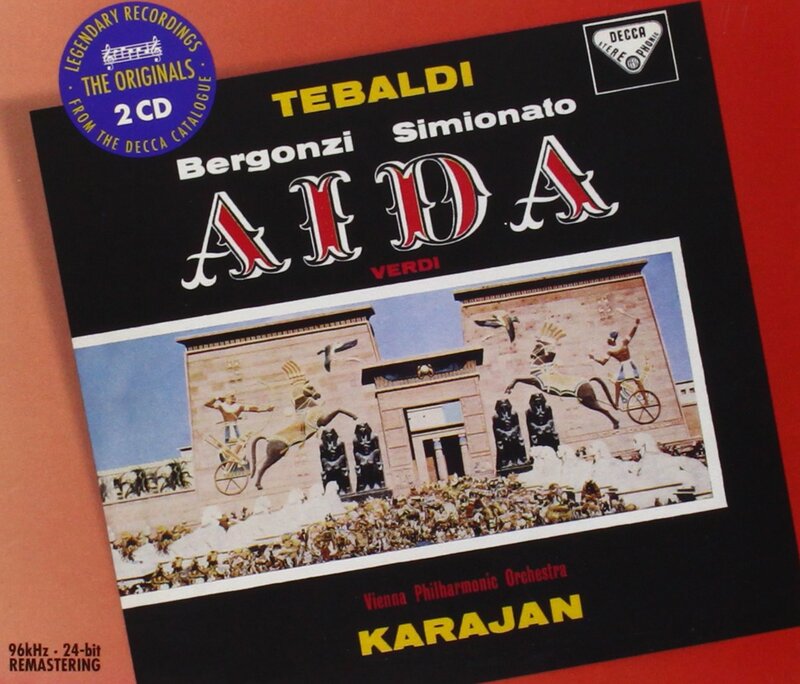 Av: Aida, Radamès……… Amonasro, good conducting and acoustics. Ds: Very warm sound, sometimes careless, taking no risks. A bolder account in acoustics than the Karajan first recording. Muti conducting is effective, careful in the orchestra but unable to wrap myself in the setting. The sound is not spectacular but fairly sharp, with attention to the strings in the Celeste Aida aria. It’s fairly effective, in the style of Solti but with less effects and more music. The only notable sound effect is placing the temple scene in the background. This recording is great anyway, very direct to the ear, incredibly well-sung. The main trio is perfect for the roles. I could say they are imposing, dramatic even outside the arias. Cappuccilli being Cappuccilli instead of Amonasro. In this one his plain singing is not wrapped by the orchestra. Ramfis and the King are great too. Av: Aida, Radamès, Amneris, bold orchestra and conducting. Music first. Ds: Effective but irrelevant in the whole (see Solti). Simplistic recording concept. Amonasro. This is a very complex recording to review. The pace is generally slow. It's strange because Karajan, Baltsa and Freni are turning Aida, one of the most popular operas, in a tougher listening experience, with lots of details that would go unnoticed in a normal recording but here provide discourse. It's not necessarily different: it's new music-making. However, it can get really boring if you need to multi-task instead of sitting carefully. It's like it never gets to the point. The dramatic scenes like the Amneris/Aida duet are a bit tiring and wrapped in orchestra but the vocal interpretation is on point. The Wiener Philharmoniker and Karajan, from a particular perspective, make this opera live without being livelier. Baltsa’s Amneris is quite fine but she finally shines in Act IV. José Carreras has his own way with Radamès. I really like it. Far from Bergonzi but surely another personality. Let's not forget that Radamès is a prince that falls in love with a slave, begs mercy for the Ethiopian prisoners and saves Amneris' life from Amonasro. His heart is full of love and a singer needs to portray it. In this side he is on par with Carlo Bergonzi. Carreras still has some issues with vocal strength in Act III. Like in Rigoletto, Piero Cappuccilli (Amonasro) is helped by the orchestra and the Karajan resonance to lift up his threats to Freni’s Aida. Mirella Freni at first doesn’t sound really fine for Aida, but she balances with dramatic interpretation and keeps improving Act to Act. The final duet in the cell between Radamès and her is really peaceful. Av: Karajan unveils the most spiritual side of Aida, unknown in any other recording. Dv: Karajan overcooks a seemingly perfect score by Verdi and makes it feel a tough listen. You better approach it with headphones rather than speakers. Last edited by Granate; Apr-07-2018 at 15:07. Last edited by RES; Oct-03-2018 at 18:19. Checking about on the web, Allan Ramsay is attributed with the 1997 remastering as well as one copyrighted in 2001 as a 'Great Recording of the Century' and further reissued in 2010 as part of the 'EMI Classics: The Home of Opera' series. Hi davidglasgow. Discogs and allmusic were the first places I looked, but their information is incomplete or wrong. You will note that discogs attributes the 1986 remastering to Allan Ramsay as well--which I think is impossible even if anyone had been listed and give 55-track lists for all four versions, though 1986 and 1997 have 37 tracks. Allmusic doesn't list any remasterer for 1986 or 1997. Both discogs and allmusic are correct that Ramsay did the 2001 GROTC and Warner (which *is* GROTC, reissued by them in 2016). That still leaves open the question of who did the 1997 EMI, for which I really need someone to look at the booklet where one would think the name would be given. Thanks. Last edited by RES; Oct-03-2018 at 19:24. Thanks for the review, Granate. I must confesss you puzzle me over the comments on the Karajan Decca: "Ds: Very warm sound, sometimes careless, taking no risks." Sometimes careless / taking no risks appears to be a contradiction. In fact the whole thing was seen at the time as a massive step forwards in the actual recording of opera by Culshaw and his team. See Andrew Porter's original review in the Gramophone. In fact enormous risks were taken with the actual sound recording which stretched technology at the time to breaking point. Some slight overload can actually be heard at some points. So I think what you term as 'safe' was for the time radical. I also can't agree that on the Callas EMI recording that 'Barbieri, Tucker and even Gobbi are the great let-downs of the recording'. Tucker is a tenor I never have had a taste for - the actual sound of his voice didn't take well to recording. But Gobbi is absolutely superb. ... and the Nile scene has to be one of, maybe the best on disc. It bristles with drama, and Serafin is also at his best here.